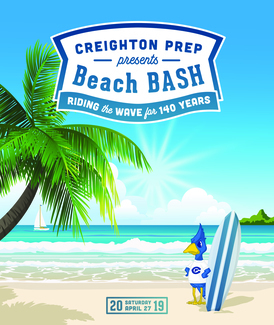 Each year, Creighton Prep relies on more than 500 volunteers to make BASH a success, and Beach BASH 2019 "Riding the Wave for 140 Years" which is set for Saturday, April 27 is no exception. If you are volunteering to work on a planning committee that meets in the weeks and months prior to the event, an executive committee chair will be contacting you soon with additional information. If you are volunteering to work the night of the event, a memo with instructions (what to wear, where to park, where to check-in when you arrive, volunteer appreciation dinner, etc.) will be sent Wednesday, April 24 to the email address you provide when signing up. Instructions will also be available online at www.creightonprep.org/bashvolunteer. Don't miss this opportunity to get involved at Prep and meet great people! Executive committee chairs for the event are Tiffany Dencklau, Melissa and Patrick Duffy '90, Cathy Goracke, Lisa Gravelle, Carrie Jenkins, Beth Kramer, Jim Naylon '85 and Michele Zadalis. If my husband is available, he will volunteer with me.